One Assassin is dangerous enough in Ubisoft's upcoming Assassin's Creed Unity , but put four of them together on the streets of 18th century Paris and you've got nothing less than a revolutionary A-Team. 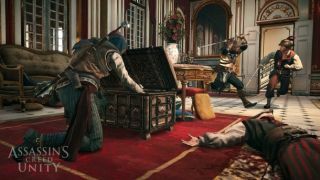 Cooperative multiplayer action is the big hook in Assassin's Creed Unity: Players can link up with one another in Parisian taverns, and then head out into the action in groups of two to four. Each player will play as Arno in his or her own game, while the others will be represented as randomly generated members of the Brotherhood. Ubisoft describes this new video as a gameplay trailer, but I think it's fair to say that's not quite accurate. It's fun to watch, and the song is nice, but I have to think that trying to control an Assassin in combat from some of these angles would be a tricky bit of business. But it makes the point: Four assassins are better that one. Assassin's Creed Unity is out on November 11.